Update: The Music section of the Market is now live! (Link). 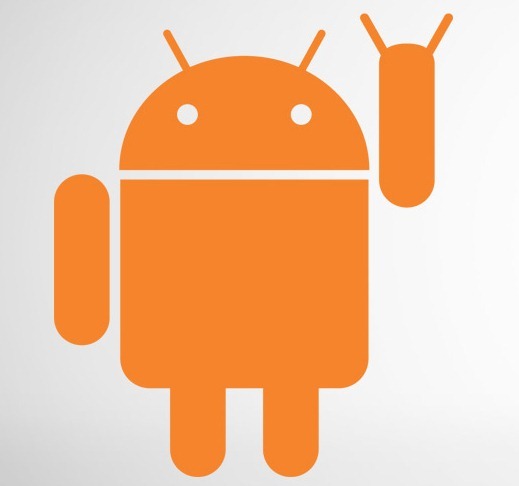 Access to Music in the Android Market (on-device) will be rolling out over the next few days on the server side (there is no new version of the Market to get the Music section). A new version of the Music app is out as well, check it out here. 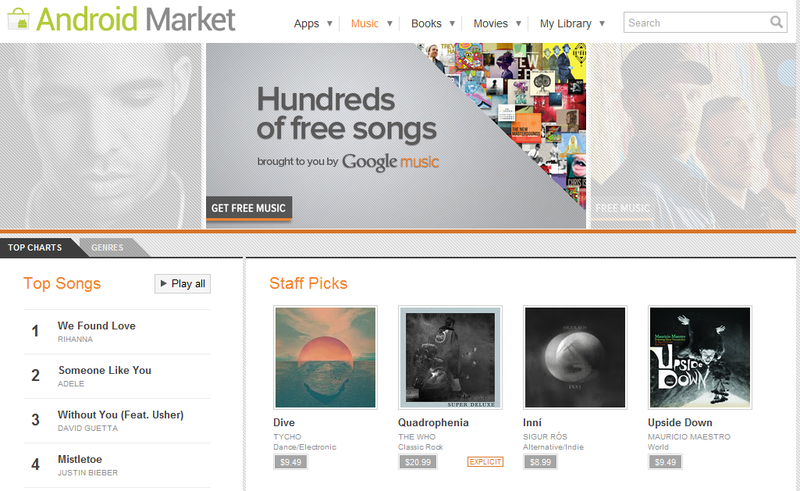 Just minutes ago, Google announced the launch of the long-awaited Google Music storefront. What's Google Music offering? 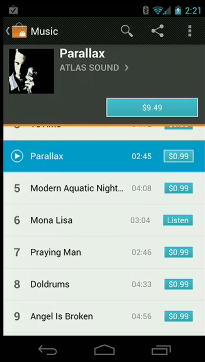 MP3 Store: Available on the Android Market as a new category starting today. The tracks are stored in the cloud as 320Kbps MP3 files - no DRM. You also get 90 second song previews. Requires Android 2.2+. Universal, EMI, and Sony are all on board (Warner Music Group is not), along with many smaller independent labels. 8 million paid tracks are live at launch, but the number will soon be 13 million. Free Cloud Storage: The original 20,000 song cap that was part of the Google Music beta will remain in place, and it will remain free. It does not appear this storage is expandable at present, but this wasn't really discussed. 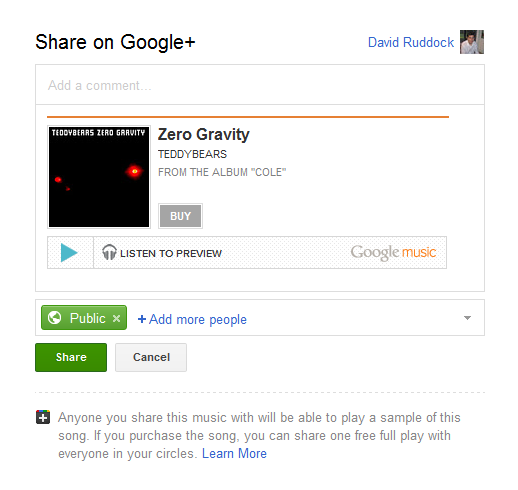 Song Sharing / Recommendation: You can share a song or album with your friends once you've purchased it via Google+ only. They'll receive one free listen of the song or album you just purchased. Your G+ friends will see any songs you've purchased then recommended in the Market as part of your Friend Stream, where the full song or album will play back once for any of your friends. Exclusive Tracks: Google Music will offer some tracks exclusively (like live tracks from The Rolling Stones, Coldplay, Pearl Jam, Shakira, and Dave Matthews Band). Busta Rhymes will be debuting his new album on Google Music. Free Song of the Day: Pretty self-explanatory, like Amazon's Free App of the Day, but with songs. 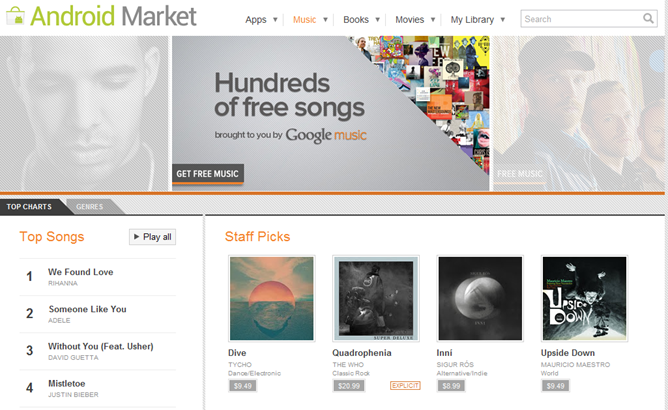 Artist Hub: Allows self-producing artists to submit their tracks to Google Music (link here). You can create an artist page, upload music, and set your own retail prices. $25 to create your own artist page. Google's cut is 30% - flat rate. T-Mobile Carrier Billing: This one is self-explanatory. T-Mobile customers will also get some exclusive free tracks. US Only: Google has only signed distribution deals with major labels for the US market. There was no mention of any future availability of the service outside the United States. We'll update as we learn more.